If you haven't read Part 1 of our trip through the Mekong Delta to Cambodia see the previous post. We woke up at 545am on Friday morning as we had to have breakfast and check out of our hotel by 7am to catch the bus. The previous day our tour had actually consisted of 3 groups, those doing a 1 day tour and going back to Saigon that night, those doing a 3 day Mekong tour and those like us doing a 2 day tour ending in Phnom Penh. The 1 day group left us when we got off the boat in Vinh Lung, and the 3 day group was going the opposite direction of us from Chau Doc so we were anxious to see who was going to be accompanying us to Phnom Penh (P.P). We had met a couple of other couples we knew were going with us during the previous days tour but figured there was more than just the six of us. There was 1 other couple from Hong Kong and a Japanese couple as well so it looked like the 10 of us would make the slog upstream. At our hotel in Chau Doc we were little late going as our tour leader was talking with a mixed group of French and Cambodians. There seemed to be some confusion regarding them but they ended up getting on our bus with us, 4 french guys, 2 cambodian women who I think were wives and two cambodian guys along with 1 child. They were all together but we never really did figure out the family dynamic. I am not sure how they joined our tour at this late stage but they proved to be trouble right from the start with us leaving about 30mins late. It turned out 1 of the french guys had overstayed his visa so they were trying to figure out how to get him across the border with the minimal amount of hassle. First we had to finish the "tour" part of our trip. This involved getting into rowboats where Vietnamese women rowed us through floating villages and we stopped to see how the people lived along with a fish farm they had. This might have been interesting except that it was blistering hot and there was zero wind! We were both sweating buckets and coupled with the fact we had done the floating village/rowboat thing in Halong Bay (where it was much more scenic and picturesque) we could hardly wait for the row boat to end so we could get on our boat to head upstream to Cambodia. About 930 we finally finished rowing and got on our boat to the border. It was about 40-50 feet long, covered with padded chairs you could move around as you pleased. Relatively comfortable but even with the boat moving no wind and blistering hot. We went upstream for about 2 hours, along the way we filled out the forms for our Cambodian Visas and paid the captain who was going to act as our fixer $22 each for the visa. Now the visa's are supposed to be $20 each but we had read there was a tendency to overcharge at this border so we chalked up the extra $2 as the service fee for having someone take care of the visa for us. About 1030 we stopped at shore and the Captain/Fixer and the overstaying Frenchman got off the boat. From the sounds of it they were going to hop on a motorbike and go through the land border and meet us at the "boat border", at least we hoped that was what happening as the Captain/Fixer had our passports and documentation! We sputtered up the Mekong for another hour before reaching the Vietnamese border. We hopped off on to the border post and told to wait in the adjacent room where conveniently there was a restaurant. We ordered a couple of mediocre meals and had a couple of lemon juices. Soon the Captain/Fixer showed up with the overstaying Frenchman, however again there seemed to be confusion and we ended up waiting about an hour and a half in total (I blame the French!). Finally the Captain/Fixer jumped up and told us to get our bags off the boat as we would be switching to a Cambodian boat for the rest of the journey. As soon as we saw the Cambodian boat we longed to get back on the vietnamese boat. Whereas on the Vietnamese boat we had padded chairs (not comfortable but padded nonetheless) and we could stand up in the boat, the Cambodian boat just had two long benches facing inwards down below. The ceiling was also less than 5.5 feet as even Betsy had to crouch down. Finally the benches were quite high so that my toes could barely touch the floor while poor Betsy's feet were dangling 6 inches above the deck! It was even more blistering hot on the Cambodia sign with even less wind than we thought possible but at least we were moving once again. That wasn't to be for long though! We stopped about 10mins after we got going to get our visa's stamped. We had visa's but no arrival cards. We got to the dock walked up a steep bank to a little building and lined up to have all our arrival paperwork scrutinized and a half dozen stamps added to our visa's and passports. It took about 15mins to process our original group of 10 and we headed back to the boat. Did I mention it was still blistering hot and no wind?? So we all got back on the boat and waited and waited and waited....where the heck were the French/Cambodian group?? About 45mins after we had finished they sauntered down the gang plank to our boat. Who knows what the problem was but once again we were waiting for them. Finally underway again we hugged the shore of the Mekong for the next few hours, saw kids swimming, buffalo swimming, kids swimming with buffalos and fisherman doing their thing. After a couple of hours we were ready to be done with the boat trip. About 515pm we got to the dock (if you could call it that) where a minibus was waiting to take us the last 90 mins into P.P. The dock consisted of a couple of 2x6's in varying states of rot held up by bamboo about 6 feet above the water. Betsy thought for sure she wasn't going to make it across that with her backpack but she did as did everyone else. Ninety minutes later and about 2-2.5 hours later than scheduled we arrived at our hotel in P.P. The hotel was decent (and free as it was included in our tour) but the location was terrible, we went out to try and find somewhere to eat with a Swiss/French couple that had been on our trip but after walking through some pretty dodgy areas and not finding anything decent or even not decent to eat we ended up back at the hotel to eat. An average meal of rice and vegetables and it was off to bed. Up at 545am and in Phnom Penh at 730pm it had been a very long travel day. There had been trials and tribulations but it was one of the adventures we will probably most remember on the trip. If we'd taken a 1 hour flight from Saigon to P.P. we would have forgotten it completely by now. After 27 days in Vietnam we were now in Cambodia, who knows what adventures we'll find here. Keep coming back to find out! Man, talk about quite the ordeal to get into the country! Hopefully the rest of your Cambodia stay will be a little less "adventurous!" 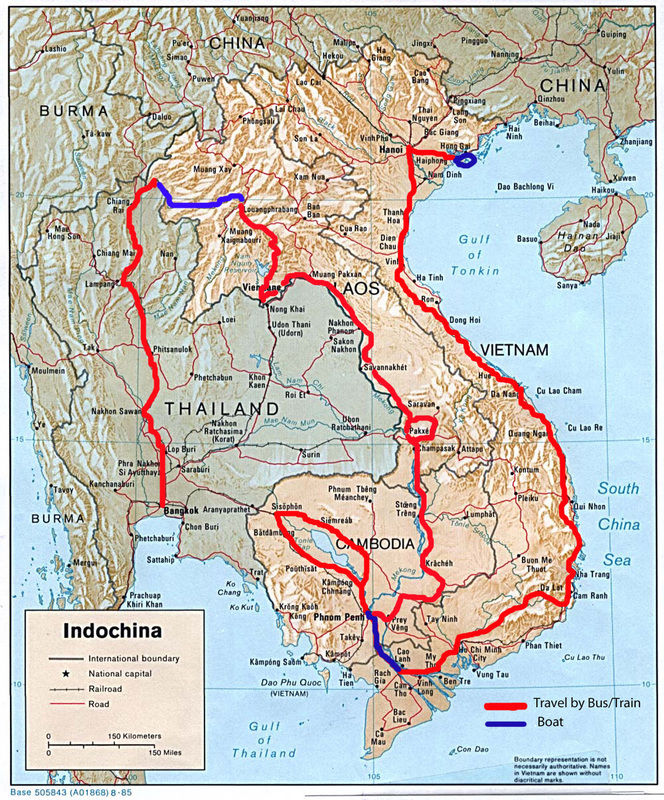 We'll see...we just got our Lao visas so we'll be traveling overland through Cambodia into Southern Laos instead of flying! That will definitely be an adventure!